Ronnie Selley, a South African from rural Natal, joined the RAF on a short-service commission in 1937, considered the Golden Age of aviation. During these glory years of Howard Hughes and Amelia Earhart few guessed at the brewing storm and dark days to come. 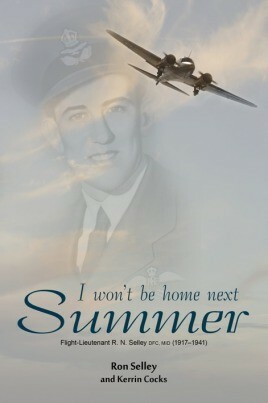 Unfortunately, due to sales rights restrictions, we cannot offer I Won't Be Home Next Summer for sale in your country. Ronnie Selley, a South African from rural Natal, joined the RAF on a short-service commission in 1937, considered the Golden Age of aviation. During these glory years of Howard Hughes and Amelia Earhart few guessed at the brewing storm and dark days to come. After completing his training on antiquated First World War aircraft, Selley was posted to 220 Squadron Coastal Command, the RAF's under-staffed and under-equipped poor relation to the more prestigious Fighter and Bomber Commands. Tasked with reconnaissance, convoy patrols and submarine-hunting the pilots of Coastal Command chalked up more flying hours than any other RAF Command. It was not uncommon for pilots to be in the air, searching the waters of the North Atlantic, for up to sixteen hours a day, in aircraft that were neither capable of such ranges nor, initially, adequately armed to defend their charges. From the outbreak of war until after its cessation Coastal Command had aircraft in the air twenty-four hours a day, every single day. The toll this took on the men of Coastal Command was unthinkable. The first RAF pilot to sink a German U-boat, Selley went on the win the DFC for his actions during the Dunkirk evacuation. He won high praise and newspaper headlines such as"Plane fights 13 German warships”, "One RAF man bombs 3 ships, routs Nazis” and "One against eight” were not uncommon. Selley subsequently suffered acute battle fatigue and spent time convalescing at the Dunblane Hydro. Thereafter, he was posted by the Air Ministry as Air Vice-Marshal Breese's personal pilot. On 5 March 1941 Ronnie Selley, Air Vice-Marshal Breese and the entire crew of the fully armed Lockheed Hudson they was flying experienced engine problems, lost speed, stalled and exploded on impact at Wick in northern Scotland.